99215 CPT® Code Description, Progress Notes, RVU, Distribution. This 99215 CPT® lecture reviews the procedure code definition, progress note examples, RVU values, national distribution data and explains when this code should be used in the hospital setting. CPT stands for Current Procedural Terminology. This code is part of a family of medical billing codes described by the numbers 99211-99215. CPT® 99215 represents the high (level 5) office or other outpatient established office patient visit and is part of the Healthcare Common Procedure Coding System (HCPCS). This procedure code lecture for established office patient visits is part of a complete series of CPT® lectures written by myself, a board certified internal medicine physician with over ten years of clinical hospitalist experience in a large community hospitalist program. I have written my collection of evaluation and management (E/M) lectures over the years to help physicians and non-physician practitioners (nurse practitioners, clinical nurse specialists, certified nurse midwives and physician assistants) understand the complex criteria required to stay compliant with the Centers for Medicare & Medicaid Services (CMS) and other third party insurance companies. Make sure to also review my detailed lectures on CPT® 99213 and CPT® 99214, both part of my complete collection of CPT® lectures organized in one easy-to-find resource on Pinterest. You don't need to be a Pinterest member to get access to any of my CPT® procedure lectures. As you master these E/M procedure codes, remember, you have an obligation to make sure your documentation supports the level of service you are submitting for payment. The volume of your documentation should not be used to determine your level of service. The details of your documentation are what matter most. In addition, the E/M services guide says the care you provide must be "reasonable and necessary" and all entries should be dated and contain a CMS defined legible signature or signature attestation, if necessary. Office or other outpatient visit for the evaluation and management of an established patient, which requires at least two of these three components: A comprehensive history; A comprehensive examination; Medical decision making of high complexity. Counseling and/or coordination of care with other providers or agencies are provided consistent with the nature of the problem(s) and the patient's and/or family's needs. Usually, the presenting problem(s) are of moderate to high severity. Physicians typically spend 40 minutes face-to-face with the patient and/or family. For all established office patient billing codes (99211-99215), the highest documented two out of three above components determines the correct level of service code. Compare this with the requirement for the highest documented three out of three above components for new office patient care encounters (99201-99205). Again, only the highest two out of three components are needed to determine the correct level of care for CPT® 99215. The following discussion details the minimum requirements necessary to remain compliant with CPT® 99215. In addition, as with all E/M encounters, a face-to-face encounter is always required. However, in the case of outpatient clinic codes, Medicare does allow incident to billing, where the the service is provided by someone other than the physician. If certain requirements are met, the physician may collect 100% of allowable charges in these situations. Services billed incident to are billed under the physician's provider number. Comprehensive history: Requires 4 or more elements of the history of present illness (HPI) OR documentation of the status of THREE chronic medical conditions. At least one item from two of three components from past history (illnesses, operations, injuries, treatments), social history or family history is also required. In addition, a complete review of systems is also required (10 or more organ systems). Comprehensive examination: The CMS E&M services guide on pages 29-30 describes the acceptable body areas and organ systems for physical exam. Either a general multi-system examination or complete examination of a single organ system (with other symptomatic or related body area(s) or organ system(s)--1997 guidelines) is acceptable. 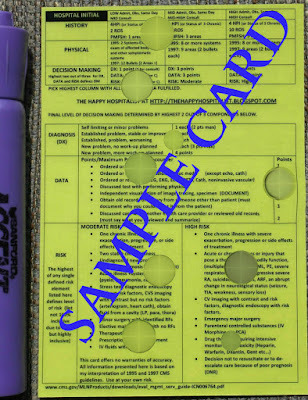 For a general multi-system examination, 1997 guidelines require documentation of at least two bullets each in at least nine organs systems or body areas (described on page 47 in E/M services guide) while 1995 guidelines require findings from about 8 or more of the 12 organ systems, not otherwise specified. Requirements for a complete single organ exam are discussed in the E/M services guide beginning on page 55..
Medical decision making of high complexity (MDM): This is split into three components. The 2 out of 3 highest levels in MDM are used to determine the overall level of MDM. The level is determined by a complex system of points and risk. What are the three components of MDM and what are the the minimum required number of points and risk level as defined by the Marshfield Clinic audit tool? Risk (high); The risk table can be found on page 35. The medical decision making point system is highly complex. I have referenced it in detail on my E/M pocket cards described below. These cards help me understand what type of care my documentation supports. I carry these cheat sheet cards with me at all times and reference them all day long. As a hospitalist who performs E/M services almost exclusively, these cards have prevented me from under and over billing thousands of times over the last decade. S) Abdominal pain. RLQ. Started yesterday. Constant. 8/10. Associated fever (at least 4 HPI). No nausea, chest pain, dizziness, shortness of breath. In the absence of these pertinent positives and negatives, all other ROS were reviewed and were otherwise negative (at least 10 ROS ). Nonsmoker. No personal history of colitis. (At least one element each from 2 of 3 past history, social history and family history). In this example history (subjective) and physical (objective) meet the requirements to get paid for a 99215. Remember, the highest 2 out of 3 components determine the highest level of service for established patients in the clinic or other outpatient setting. Do note that linking an ICD code to a CPT® medical code is required for all visits submitted to CMS for reimbursement. Therefore, most progress notes should provide at least one ICD code to clearly indicate a purpose for the visit. I suspect this is necessary to meet the reasonable and necessary threshold, unless that can be inferred from other chart documentation. Medicare doesn't want to pay for doctors to talk about politics with their patients. There must always be an approved ICD code linked with the CPT® medical code when billed to CMS and most other insurance companies. I think it's always a good habit to include at least one ICD code in your note documentation, even though it's not technically required for established patient clinic follow-up visits that can achieve compliance with history and physical elements alone. It is required, however, to submit for payment and to link with a CPT® code. Most of the time, if you are documenting a physical exam of this intensity, an assessment and plan is necessary to provide good patient care and follow up. That doesn't mean it is technically required by the 2 out of 3 rules of E/M. S) Cough resolved; No SOB; No CP. No fever. No sputum. All other systems were otherwise reviewed and are negative (at least 10+ ROS). Stopped taking lisinopril due to cough. Smoker. (at least one element each from two of three for past medical history, family history, social history). As you know, documenting the status of three chronic medical conditions can substitute for the HPI. Add in at least 10 review of systems and one element each from two out of three for past medical, family and social history and this is the minimum history documentation required for CPT® 99215. 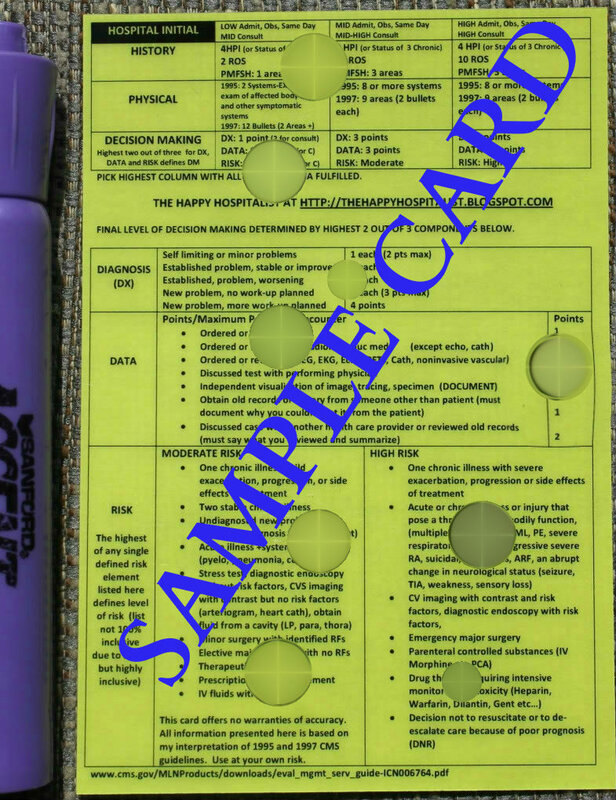 With at least 2 bullets documented in each of 9 areas in the general multi-system physical exam, this note is complete and accurate and meets documentation requirements to get paid for a 99215. All physical exam components offer value to the encounter to exclude potential complications of therapy or to search for evidence of decompensation of disease. This note meets criteria for 99215 based on the E/M rules for history and physical exam but not for medical decision making. But remember, for outpatient established clinic patients, only two out of three components from history, physical and MDM are required to be at the highest level. The medical decision is a level 4 based on 4 points for diagnosis (HTN, DM, COPD, cough) and moderate risk (prescription drug management by starting an ARB). Is it reasonable and necessary to do a complete history and complete physical if medical decision making is not a level 5. S) Cough started 2 months ago; Constant. Worse with smoking. Nonproductive. Better with inhalers. Associated with wheezing (at least 4 HPI). No SOB; No CP. No weight loss. No sweats No fever. All other systems were otherwise reviewed and are negative (at least 10+ ROS). No FH of lung cancer. Smoker. (at least one element each from two of three for past medical history, family history, social history). O) 120/80 80 Tmax 98.9 (three vital signs = one bullet). Wheezing present. symmetric chest expansion. Normal cardiac exam. This note meets criteria for the highest level established outpatient clinic note based on history and medical decision making. Physical exam does not meet the threshold for a 99215 but it does not have to in this case. Remember, the two out of three rule for history, physical and MDM. The history meets based on at least 4 HPI, at least 10 ROS and at least 2 from past medical, social or family history. Medical decision making is the highest level based on data and diagnosis, with 4 points each. The risk table does not apply in this example. All elements are reasonable and necessary based on physician expertise and differential diagnosis possibilities. A new problem such as a cough can be a manifestation of multiple systemic conditions and a complete ROS can be justified in any audit situation. S) SOB. Started one hour ago. Severe. Constant. Associated with 2 word dyspnea. Not better with home inhalers. Better with lying still. No chest pain. No associated cyanosis (at least 4 HPI). All other ROS were otherwise reviewed and negative (at least 10 + additional ROS). Still smoking. Takes duoneb and Advair (one element each for social history and medical history). A) 1) Fever with hypoxemia, suspected pneumonia. Get CXR and admit to hospitalist. (4 points in the diagnosis component for a new problem with more work-up planned (fever)). P) Admit to hospitalist (high risk for acute or chronic illness that poses a threat to life or bodily function for respiratory distress). This patient meets criteria for a level 5 established outpatient clinic note based on history and medical decision making. It contains all the necessary HPI, ROS and PMFSH components. The statement indicating all other ROS were were reviewed and otherwise negative is allowed to substitute for individually documenting each element of the ROS process. This is allowed based on E/M guidelines published by CMS. In addition, the MDM is a level 5 progress note based on diagnosis (4 points) and high risk. Notice the volume of documentation matters much less than the quality of what is written to support the E/M charge appropriate for the visit. In my discussions above, I have detailed several examples of the minimum documentation required to meet compliance for a level five established patient clinic visit. When would a hospitalist bill an established patient clinic procedure code in the hospital setting? The CPT® medical billing code group 99211-99215 should used by hospitalists and other physicians or nonphysician practitioners in the hospital setting under certain circumstances. I have previously discussed all the possible admission codes that could be used in the hospital setting These established patient clinic and other outpatient visit codes are included as possibilities. I have provided a detailed discussion of that decision tree analysis at the link provided just above. However, I will discuss the pertinent portions of that analysis here. If the patient has not been seen in the last three years by the same physician or partner physician in the same group and exact same specialty, the consultant should use the new patient clinic code group 99201-99205 on their initial date of service and then choose a code from the established outpatient code group 99211-99215 for all subsequent observation services, including the day of discharge. Remember, all hospital observation CPT® code groups are reserved only for the attending physician. What is the distribution of CPT® code 99215 relative to other levels of service in this medical code group? The graph below was published in May, 2012 by the OIG in a report titled Coding Trends of Medicare Evaluation and Management Services. You can find these tables and charts starting on page 9 of this link provided here. As you can see, between 2001 and 2010, the distribution of established patient office visits has shifted higher. The proportion of level four 99214 and level five 99215 reimbursements has increased by 15% and 2% respectively, while the proportion of level three 99213 services billed for payment has decreased by 8% between 2001 and 2010. On an absolute percentage basis, in 2010, CPT® code 99215 was being billed 5% of the time, up from 3% of the time ten years previously. Here is data from the most recent 2011 CMS Part B National Procedure Summary Files data (2011 zip file) showing how many CPT® 99215 encounters were billed and the dollar value of their services for Part B Medicare. As you can see in the image below, E/M code 99215 was billed 9,694,388 times in 2011 with allowed charges of $1,316,879,153.56 and payments of $935,217,434.74. How much money does a CPT® 99215 pay? That depends on what part of the country you live in and what insurance company you are billing. 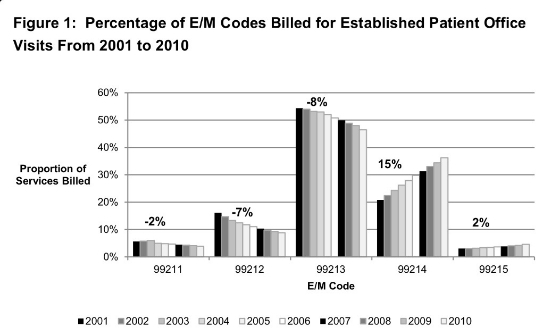 E/M procedure codes, like all CPT® billing codes, are paid in relative value units (RVUs). 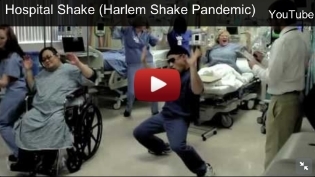 This complex RVU discussion has been had elsewhere on The Happy Hospitalist. For raw RVU values, for 2017 a CPT® 99215 is worth 3.14 total RVUs for facility services and 4.08 total RVUs for non-facility. The work RVU for 99215 is valued at 2.11. A complete list of RVU values on common hospitalist E/M codes is provided at the linked URL. What is the Medicare reimbursement for CPT® code 99215? In my state, a CPT® 99215 pays just over $106 (facility) and $137 (non-facility) in 2017. The dollar conversion factor for one RVU in 2017 is $35.8887.